In theory, I love that things are going this way. However, my biggest problem with EyeFi in higher end bodies was the range. The metal shell basically acts like a Faraday cage. This severely limits the range of the cards. Shooting on a D300s body, I would get 6ft on good day in direct mode between myself and an iPad. I ended up having to buy a small USB router (new, faster version) and battery that stayed in my pocket. As long as it’s within a couple of feet of my camera, the range extends a couple of hundred yards. But, it still shouldn’t have been necessary. Hopefully, Canon have solved this issue and you can get good working distance between yourself and the receiving device. One big difference between this and the EyeFi is that this is not a storage device. It has no capacity and only offers Wi-Fi functionality. 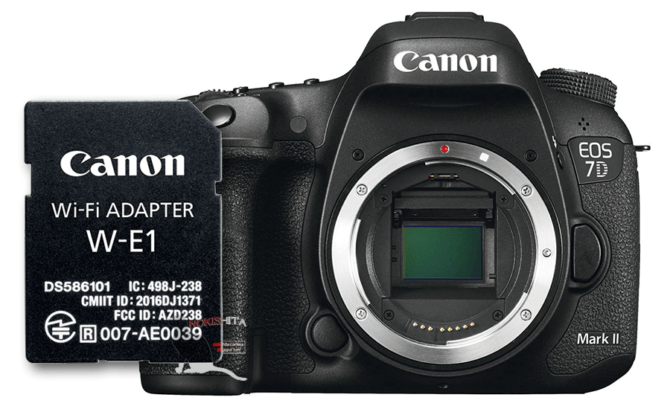 It will only work in a dual slot camera, and you still need a CF card in your main slot in order to use this. With that, here’s the list of bodies. Not surprisingly, bodies with built in Wi-Fi and lower end bodies with only a single SD card slot are not listed. So, the 10m estimated range seems like that have at least partially figured out the problem. If you’re shooting out on location and want to tether to a device further away, you can still always use the USB router to extend your signal. No word yet on pricing, availability or even an official announcement date, although Canon Rumors are reporting that it is expected to cost around $40USD. It will be interesting to see the reaction to this once it becomes available. EyeFi almost always worked perfectly for me, but problems plagued many. Mostly these were due to the Faraday cage type effect mentioned above. I’d also be curious to see how it performs in the real world outside of a lab. I have a feeling that 10m might be a little optimistic once you add your average person’s gadgets into the atmospheric mix. What do you think? Will an SD based Wi-Fi solution cut it? Or do you think they should stick with external dongles and Wi-Fi grips? Assuming the price is right and you own one of the compatible bodies, will you get one? Are you disappointed it won’t work with other bodies? Let us know in the comments.